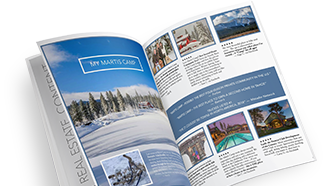 The Martis Camp real estate market has been in full swing since January 1, 2016, with 36 properties closed or in escrow for $104,900,000 in volume. This comes after a strong finish to 2015 where 111 properties were sold totaling $193,682,000 in volume (breakdown below). The demand for Martis Camp continues to grow. To date, over 301 homes have been completed with another 92 under construction and 99 more in design review (that’s a total of 492 homes). Market conditions are changing daily as we approach the end of new Developer homesite sales with only 15 remaining. This, along with a collection of coveted resale homesites and custom homes, makes now the perfect time to consider your real estate options at Martis Camp. In today’s second home real estate market nothing is more powerful than specialized knowledge and expertise. Since the inception of Martis Camp in 2006, the team of agents at Martis Camp Realty have been solely focused on helping prospective buyers and sellers with their real estate needs. The knowledge and insights that our team of agents have garnered, along with access to the Martis Camp amenities, is invaluable for buyers looking to consider ownership. So valuable, in fact, that the Martis Camp Realty agents have sold more than 800 properties for over $1Billion in sales through their specialized insights of the amenities, club and individual properties. We invite you to connect with our team to get more details and to set up your personalized journey at Martis Camp.